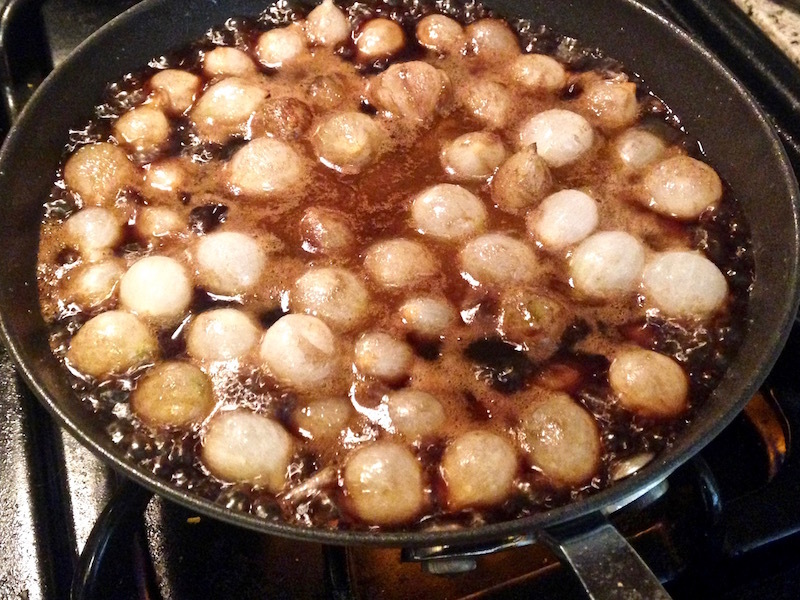 Simple Glazed Pearl Onions | Keep It Up, David! I really like pearl onions. 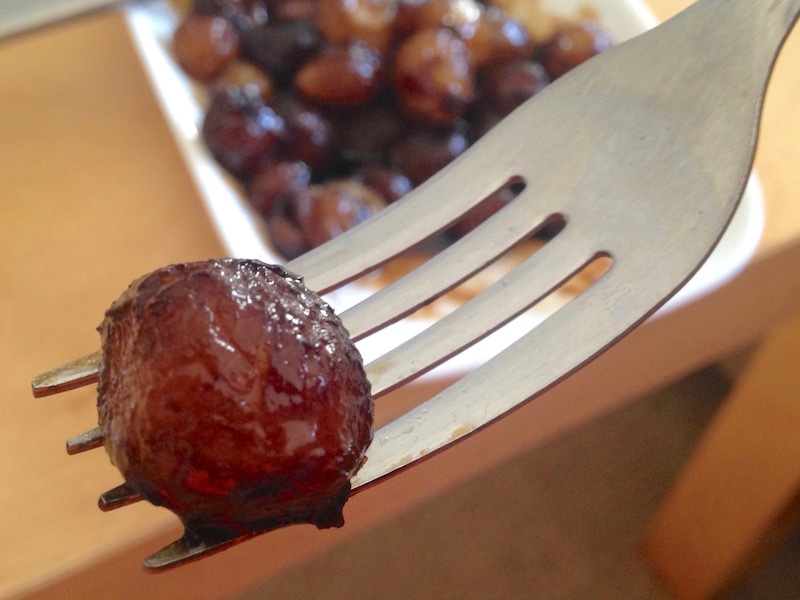 They’re tiny, adorable, grape-sized onions, and they’re typically sweeter than their bigger cousins. You can find them pickled and jarred, and I’ve had a jar on hand in my fridge for the past couple months. I toss a handful onto salads, or in with other veggies that I’m sauteing. The pickled ones are sometimes called cocktail onions, and they’re used as a garnish in some cocktails, notably the Gibson, which is a martini with a cocktail onion instead of an olive. 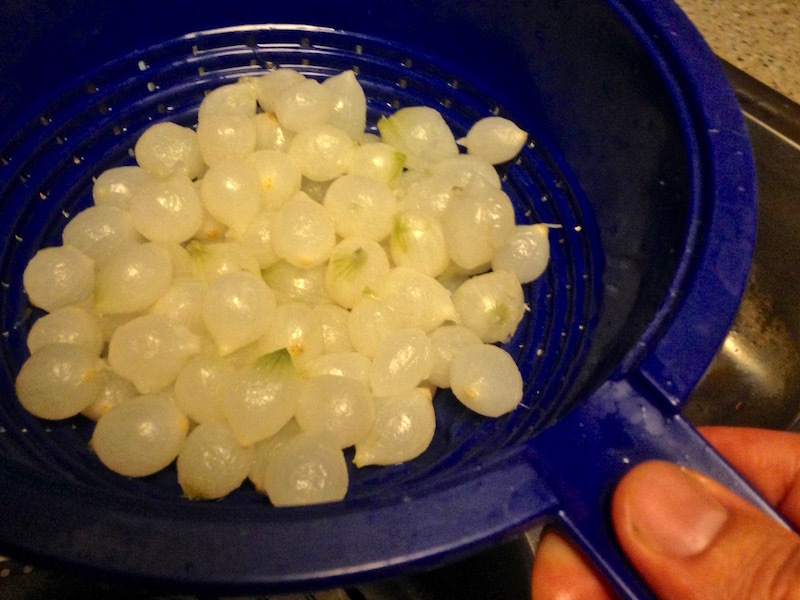 In addition to jarred and frozen, you can find fresh pearl onions in the produce aisle, and that’s actually the only kind I haven’t bought, because peeling a pound of pearl onions seems like a tedious chore, and the jarred and frozen versions come pre-peeled. RELATED CONTENT: Tons of Healthy Recipes on My Recipes Page! You can find a lot of recipes online that call for pearl onions – stews and soups and such – but not many that feature them in the starring role. And most of the dishes that do have them in a starring role are ‘creamed pearl onion’ dishes, and I don’t have heavy cream lying around, nor do I want to buy it. I thawed that 14-ounce frozen bag in the fridge overnight, and then give them in a quick rinse in my colander. Meanwhile, I melted 3 tablespoons of butter in a non-stick skillet, and when it was bubbly, I added the onions, and sauteed them for a minute or two. It seems like a lot of liquid, but it doesn’t stay liquidy for long. Bring the concoction to a boil and let it simmer until the liquid reduces. Mine took about 10 minutes, on medium-low heat, although I bumped up the heat partway through to speed up the process. 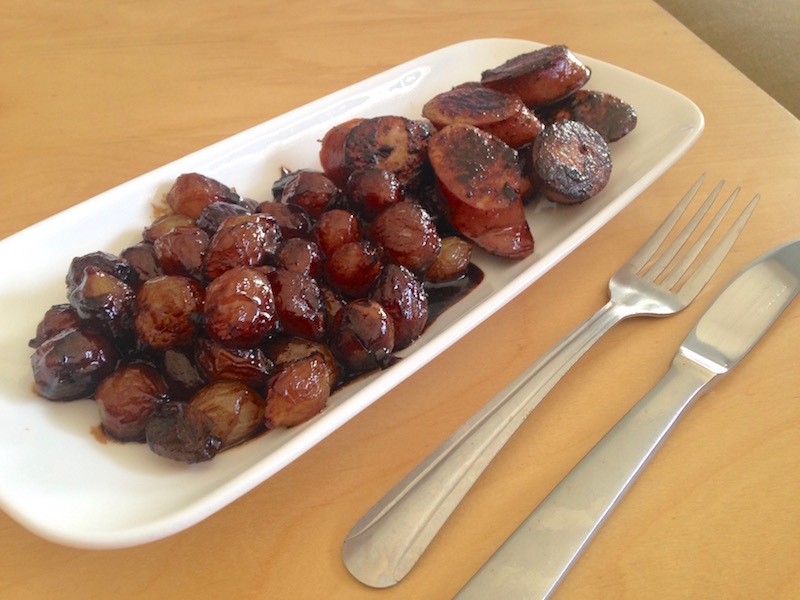 I ate it with some pieces of roasted garlic chicken sausage, that I seared in another skillet, and both parts of my meal were delicious. It was a very brown meal! I actually had some fresh chives that I was going to sprinkle on top for a little green, after I plated it, but I forgot. Oh well. The glaze reduced into a thick, flavorful glaze that was both savory and sweet, and each individual onion popped in my mouth, like cooked cherry tomatoes do. Fantastic! The best part is that this is a pretty versatile side dish. It’d be great with other proteins, like turkey or beef, or served on top of quinoa. Versatile, delicious, healthy, easy. What more could you ask for in a dish? This entry was posted on Wednesday, March 9th, 2016 at 12:17 am and is filed under Uncategorized. You can follow any responses to this entry through the RSS 2.0 feed. You can leave a response, or trackback from your own site. You are a fountain of information-I had no idea about pearl onions not really being “pearl onions”!! 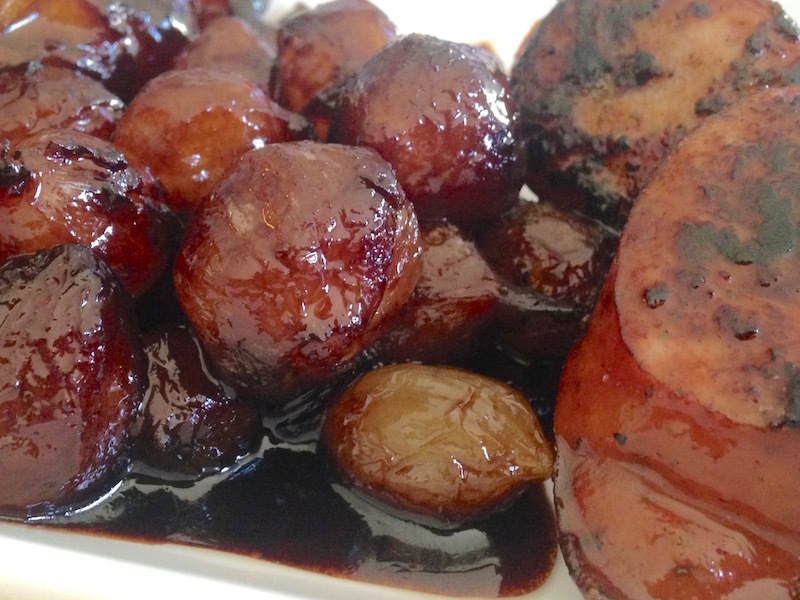 This recipe sounds delicious-and I love molasses AND balsamic vingegar! 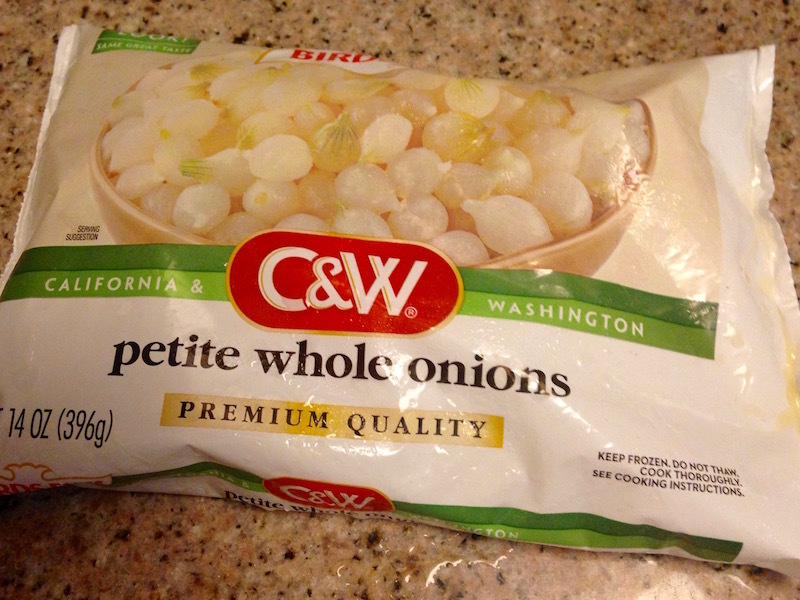 And no…I will not be trying fresh “pearl onions”…I cannot even imagine trying to peel a bag of them-probably lose my mind! Thanks! I just like doing my research. Hope you try it and hope you like it! Those look delicious! Pearl Onion is an okay drag queen name. What did Maude think of them??? Maude knows better than to bother me when I’m eating! And vice versa.